Ready to learn about the Leonberger temperament and how to bring one home for a good price? I bet you are, and we will in 10 seconds. But first, some interesting history on the Leonberger dog breed that will make you the “smarty pants” at your next dog party. The Leonberger originated from the German town of Leonberg. Legend has it that this dog breed was created as a way to symbolize the lion in the town's crest. And get this: The “Leo”, as it is affectionately known owes its existence to the politician, Heinrich Essig. Who knew politicians were into the dog breeding business. But Essig apparently traded between 200 and 300 dogs a year!! Now when someone asks “what breed is dog your dog?”, imagine you impressing them with more than just the breed name and giving them the story behind the Leonberger. Now let’s find out if the Leonberger's temperament is up your alley. The Leonberger is a people-friendly dog. While he's a good guard dog, his friendly people loving nature does not make him the best watchdog. So don’t expect him to sound the alarm if left outside to defend the house. That said, whether inside or outside, bark or no bark, one look at this dog, and a burglar will go running in the other direction! Despite being such a gentle giant, though, you should not leave the Leonberger alone with small children. The key here is “giant,” meaning he may accidentally hurt the child with his large size. The Leonberger is also very sensitive. Have you ever seen a cartoon where the large, scary guy suddenly cries and hugs his teddy bear? That's the Leonberger. Because of his sensitivity, the Leo gets very upset if he sees his people fighting. He may actually try to break the argument up if things get too loud. Yes, that's right – when you own a Leo, you have to argue in private, just like you would with your own children. 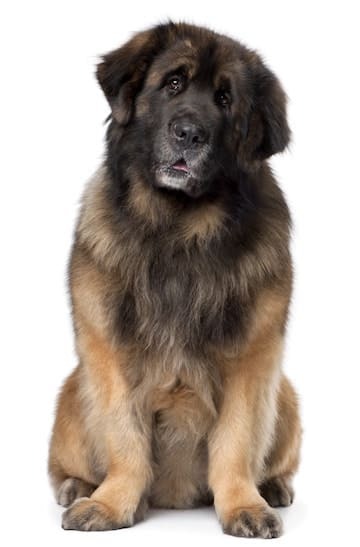 The Leonberger's size is impressive: a full-grown male can stand at 31 inches and weigh as much as a human being! The Leonberger line almost ended during World War I. Two breeders were able to revive the line, even after discovering that only five of the last 25 Leonbergers could be bred. Leonbergers are sensitive to emotions, which makes them great therapy dogs. You have to be especially careful with how you train a Leonberger due to his strength and size. He needs to learn at a young age that it is crucial that he takes care in his movements. 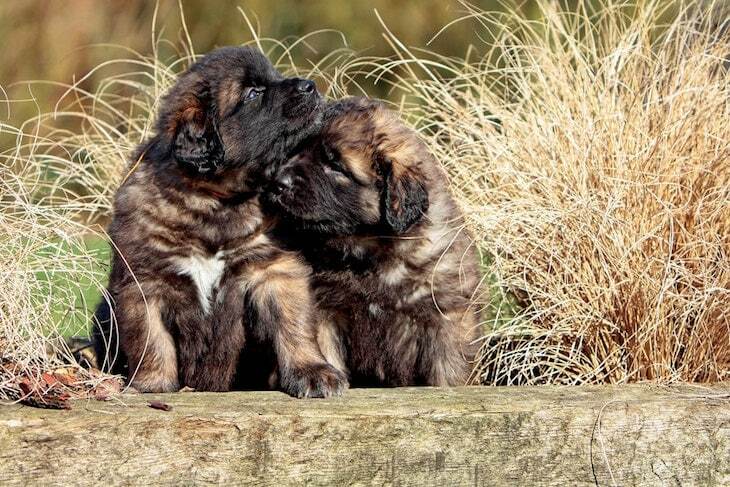 Leonberger puppies should be socialized young and often, with as many people and types of animals as possible. You may need to take your Leo to group training classes, especially if he is stronger than you (click here to explore great online dog training resources). His socialization skills will be more or less permanent by the time he's 20 weeks old. If you need help, seek it. This is a dog that must be trained properly while he's still young. As you might expect, the Leonberger requires more grooming and exercise than other breeds. With a coat like his, it is no wonder the Leonberger sheds like crazy. While he sheds his coat twice a year, he also sheds continually in between. As you can probably tell from his size, the Leonberger is not the right dog for small spaces, like apartments – especially as a puppy. Once he's an adult, he won't have quite as much energy, but he'll still need slightly vigorous exercise every day. A walk a day is just not enough for this big guy. This is the kind of dog who can run alongside your bike, or join you for a hike on the trails. One of the most important health concerns to know about with Leos is bloat. With bloat, the dog's stomach gets twisted and gas becomes trapped. Symptoms include vomiting, drooling, the inability to sit still and an enlarged abdomen. If you suspect bloat, you must bring your dog to the doctor ASAP. The condition can be fatal. A healthy Leo can live, on average, about 7 years, but some dogs can live to be between 10 and 12 years old. It may be difficult to find the perfect Leonberger puppy. This is a rare breed, so you may have to go through a breeder, rather than adoption, to find the right dog for you. Leonberger puppies, because they're rare, are expensive. Even if you're not looking for a puppy to show, but just to have as a pet, the Leonberger price tag is around $2,000! When you see a Leonberger for adoption, you may want to jump at the chance, especially if he's a trained adult whose owners just couldn't keep him anymore. With adults, you have a better idea of what you're getting yourself into. It is easier to tell how well trained he is and if he may have any health issues. If you're interested in adopting a puppy, the bright side here is that you can train and socialize him yourself, even if he may still be at that chewing and disobeying stage. Leonbergers are rare. If you don't immediately adopt one when the opportunity appears, you may wind up on a waitlist and resort to paying a higher price tag when one finally comes to the shelter. 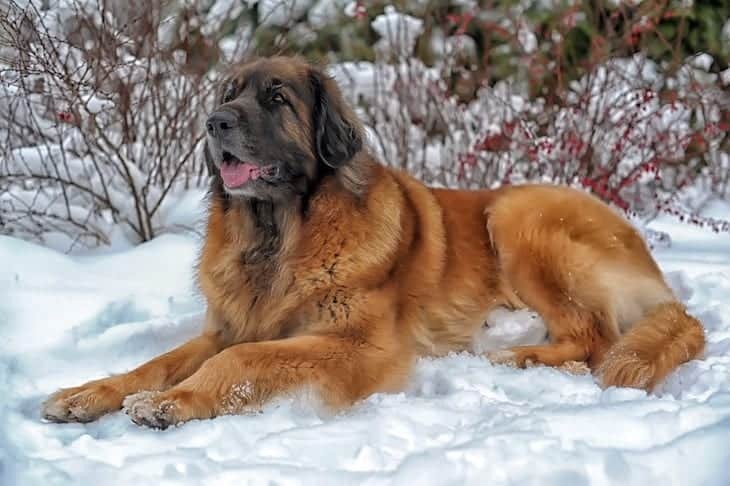 If you've been looking for months and you simply can't find any Leonbergers for sale at the shelter, then a Leonberger breeder may be the way to go. However, make sure to do your research. If the breeder is not registered with the Leonberger Club of America, it is more likely that you will get a sicker dog after paying all that money. This is because, if breeders aren't being forced to follow the rules, they can do whatever they want. They can breed sick dogs with each other. Or practice inbreeding – breed dogs who are related to each other. This can lead to genetic abnormalities that would not be seen in dogs that are not inbred. Inbreeding tends to happen more often with “pure-bred” dogs as a way to meet the supply and demand that follows a particular breed – especially rarer breeds, like the Leonberger. The Leonberger is such a gentle soul, despite his huge size. He's sensitive to people's emotions and gets upset when they do. He's a great guard dog, but don't keep him outside to keep watch. He wants to be where his people are. You must train your Leo while he's still young. He is too large of a dog to be doing the wrong things when he's older. You will need to brush your Leo as often as you exercise him – which may be quite a bit. Because of the rarity of the breed, you may not be able to find a Leonberger for sale at your local animal shelter. If you do go through a breeder, be sure to research the breeder before paying significant money for a puppy. Next post: Nova Scotia Duck Tolling Retriever Temperament – Patience, Love and Intelligence What More Can You Ask For? Previous post: Shiba Inu Price (Puppy, Adoption, Breeders) – What They Cost To Own?